I have read a couple of other novels by Lisa Jewell which I very much enjoyed but none have come near the absolute pleasure I have recently derived from reading One Hit Wonder which I think is a wonderful novel! Before I started reading it I did wonder whether it would live up to the praise heaped on it on the back cover – ‘will keep you up all night in a sweaty addicted reading frenzy (The Times) and ‘stands out from the mass of chick-lit like a poppy in a cornfield’ (Nova) – but having read it I have decided that it is certainly worthy of this praise and more! One Hit Wonder tells the tragic tale of Bee Bearhorn who had a massive music hit many years ago before disappearing into oblivion after a couple of subsequent flops. Fifteen years later she is found dead in her flat and no one knows why she might have been driven to take her own life. It is up to her half sister Ana, fifteen years younger and estranged from Bee for many years, to try to fit all the pieces of Bee’s life together in order to reach some conclusions. Her journey takes her to London where she meets up with some of Bee’s interesting friends who help her in her quest. There is also a hint of romance with one of them too which is quite unexpected although welcome for Ana. AS they discover things that happened to Bee over the last few years they sort of realise that perhaps they never knew Bee very well at all. This makes them sad especially Ana who also feels nostalgic for the sister she never knew and for the relationship that they might have had. It is also a journey of self discovery for Ana who through finding out about Bee’s life, starts to question her own and particularly the relationship that they both had with their mother. I thought that all the characters in One Hit Wonder were brilliant and this was one of the things that made it such a readable book. I pretty much liked every character I met and appreciated all their different traits and foibles. I even found myself warming to Bee’s and Ana’s mother who although not very nice on the surface has her own problems to contend with. I also loved the craftsmanship of this novel and the way in which the story is told. It starts with a very intriguing letter written from Bee to Ana but the reader does not realise the significance of this until much later. The story takes place after Bee’s death but at key moments there are flashbacks when we witness what happened at crucial times in Bee’s life and we also get to know her as a person. These flashbacks are perfectly placed and really help the reader to piece everything together at the same time as Ana and her friends. Because we don’t understand what happened to Bee, it makes the book read like a mystery even though it is also described as a romantic comedy. I wouldn’t describe it as that though. It is pretty compelling reading though and I found myself hooked from the very first until the very last page. I loved every word that I read – there were no slow bits, nothing was irrelevant and I just wanted to keep going to satisfy my curiosity and find out what really happened. It was a really involving read which is probably why there were many pages that brought me to tears in a sad but happy way! 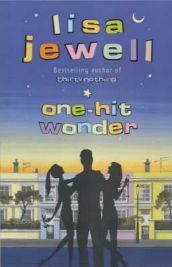 One Hit Wonder is definitely the best book by Lisa Jewell that I have read so far and that is by no means saying that I did not enjoy the others because I did. It has definitely left me wanting more which is why all the other Lisa Jewell titles will soon be appearing on my Amazon wish list! No Comments on "One Hit Wonder"